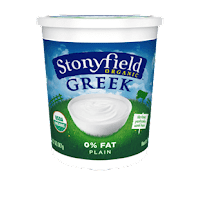 This month, the Stonyfield Clean Plate Club is partnering with the nice folks at Ball Canning to feature easy recipes that can be served in their wide range of lidded jars. 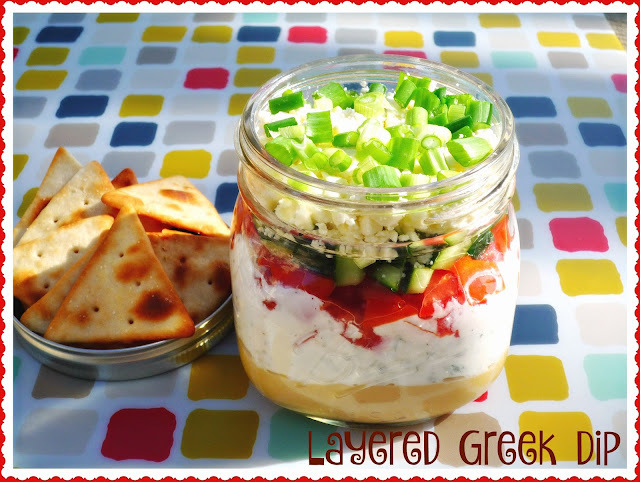 I used ultra creamy Stonyfield 0% Fat Greek yogurt and Ball Canning's convenient wide-mouth pint jars to create a Layered Greek Dip. This fun appetizer features all of my favorite Mediterranean flavors like hummus, lemon-infused Greek yogurt, briny feta, and fresh veggies to create a colorful and pretty dip. This multi-layered dip can be assembled in about 15 minutes, then it can be stored in the fridge until you're ready to serve. Each pint-size serving is enough for two people to share, making it a fun and romantic idea for any upcoming Valentine's Day celebrations that you might be planning. Just add some crunchy pita chips on the side, and you've good to go! Step 1: Remove the lid from the Ball Canning wide-mouth pint jar. 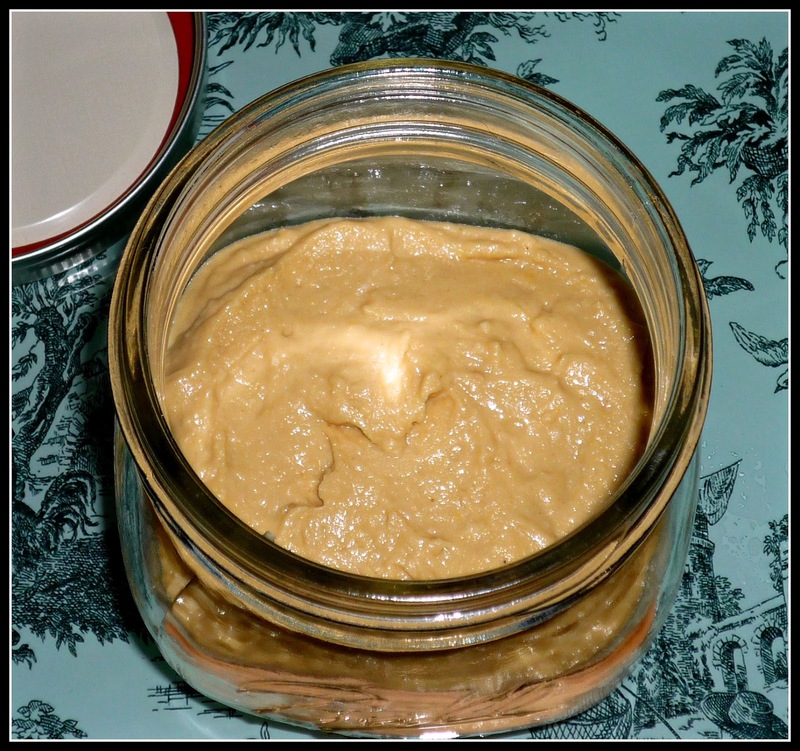 Carefully spoon the hummus into the bottom of the jar. Use a small offset spatula to evenly spread the hummus to the edges of the jar. Step 2: Combine the Stonyfield Greek yogurt, parsley, lemon juice, and salt & pepper in a small bowl. Stir well to combine. 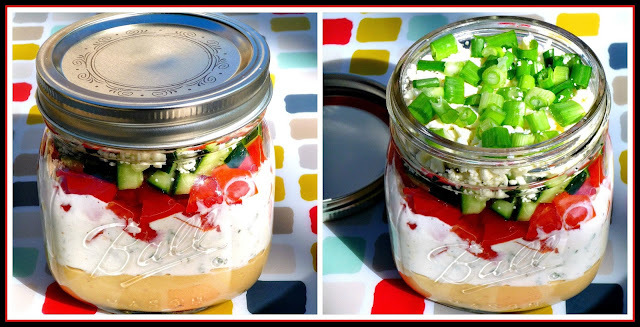 Carefully spoon the yogurt mix on top of the hummus in your jar. Use an offset spatula to spread it evenly to the side of the jar. Step 3: Add the chopped tomato on top of the Greek yogurt mixture. I sprinkle first around the edge of the jar, then fill in the center. Using the same method, top the tomato with the chopped cucumber. I like to sprinkle a bit of salt and pepper on each of the veggie layers for added seasoning. 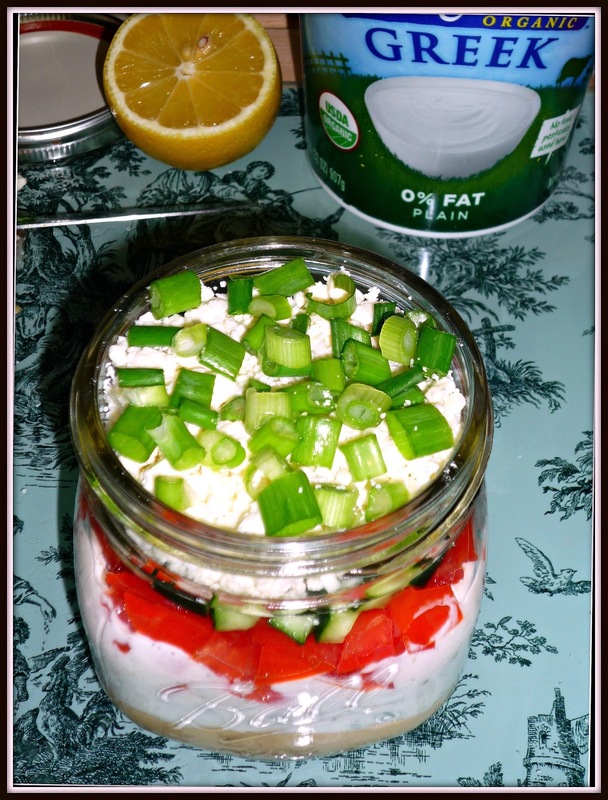 Finally, add the feta and top with the chopped green onion. Screw on the lid and refrigerate, upright, until ready to serve. Step 4: To serve, remove the lid from the chilled dip. Serve with crispy pita chips on the side for dipping. I also like to include a long teaspoon to ensure that a bit of every ingredient ends up on my pita chips. This veg-friendly dip is bursting with bright Mediterranean flavors! Salty feta, tart lemony Greek yogurt, and earthy hummus combine with the fresh veggies to make a delicious appetizer or shared first course. 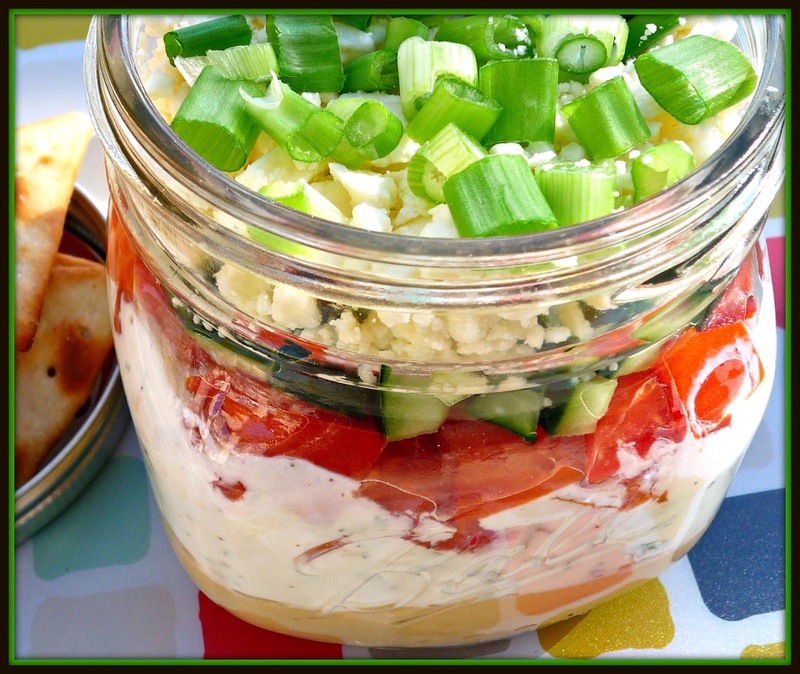 The Ball Canning jar made for a perfect presentation -- and it makes this dip easily portable too! I hope you'll give it a try and let me know what you think. 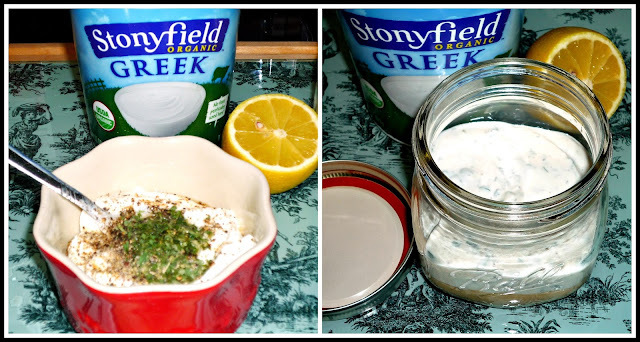 Disclosure: I received Ball Canning jars and Stonyfield 0% Fat Greek Yogurt to facilitate this post. As always, all opinions expressed are solely mine.